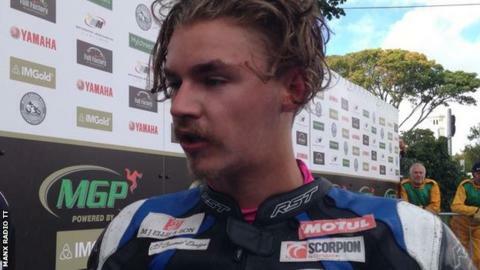 Teenager Malachi Mitchell-Thomas stormed to victory in the Senior Manx Grand Prix, smashing lap and race records for the Isle of Man event. The Horwich racer finished one minute 37 seconds ahead of Wigan's Rob Hodson to beat the race record by 3.8 seconds. His final circuit of 122.221mph also meant he beat Alan Jackson's 2005 lap record to become the fastest man in the event's history. Mitchell-Thomas said he was "over the moon" to win the race. Earlier in the week, he lost to in the junior race by under two seconds, having also set a lap record. He said: "I knew we had the pace and the bike was mint. I just got the hammer down and didn't roll off." Manx rider Andrew Dudgeon completed the top three places. The race was later red flagged following three separate incidents on the final circuit at Cruickshank Corner, Brandywell and the 33rd Milestone. Organisers confirmed three riders have been flown by helicopter to Noble's hospital but their condition is not yet known.